If you’re anything like me, you spend at least a little bit of time each summer reflecting on the year you just finished and wondering about the year to come. Because I’m slightly neurotic, my internal dialogue also usually includes a little bit of doubt about whether or not anything I do makes a difference. Sometimes that thought gets magnified by external sources. Cue the positive self-talk and Stuart Smalley clips. But the thing is, what SLPs do does make a difference. And just when I needed it, I was given a glimpse at proof. I offer up to you a letter, written to one of our Hello clinicians from an 11th grade student who was on her caseload this year. I don’t know, really, what’s most touching about the letter . . . the heartfelt words themselves, the sentence structure and grammar that are a little window into what kind of kiddo he might be, or the idea of a struggling student putting his gratitude down on paper in such a way that it is palpable to anyone who reads it. 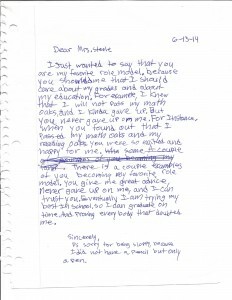 Sharon Soliday says that, while it is technically a letter to Mrs. Steele, it is really a letter to all of us. That this isn’t just a reflection on this particular excellent clinician, but a reflection of who we strive to be as a company. I say that the letter says things that no amount of positive self-talk could ever say. It says that our hope against hope, our faith in kids that no one else has patience for, that those aren’t romantic notions fueled by latent a Super(wo)man complex. No. Our trust and hope and faith are facts driven by the conviction that all kids matter. We aren’t the doubters that this student wants to prove wrong. We are the BELIEVERS. What we do matters. It mattered to this young man, and it matters to the thousands of kids all SLPs see every year. Thank you, Mrs. Steele, for being a believer and changing the trajectory of this kiddo’s life. Thank you also for sharing your letter and letting the rest of us bask in it’s glow for a hot minute. I’ll take this stuff over Stuart any day of the week.